Mesothelin is a protein made by mesothelial cells that line the pleura, peritoneum and pericardium. The antigen is produced at higher levels when the cells turn cancerous. Blood tests to measure mesothelin help monitor mesothelioma growth and response to treatment. Mesothelin can be over-expressed (over-produced) by several cancers including malignant mesothelioma, ovarian cancer and pancreatic adenocarcinoma. This increased expression makes mesothelin a good candidate as a tumor marker to diagnose and monitor mesothelioma, and a good target for anti-cancer therapy. As mesothelioma tumors grow, they produce more mesothelin. When tumors shrink, they produce less mesothelin. Measuring mesothelin allows doctors to monitor the growth of mesothelioma and its response to treatment. Approximately 71 percent of mesothelioma patients have high levels of mesothelin in their blood, according to a 2006 study published in Clinical Cancer Research. The study also reported a 71 percent decrease in mesothelin levels the day after cytoreductive surgery among peritoneal mesothelioma patients. Mesothelin became undetectable by the seventh day after surgery. This research suggests that mesothelin can help doctors monitor a patient’s response to treatment. The big hope with mesothelin is that it will prove an effective target for anti-cancer therapy among people with mesothelioma. Mesothelin is a protein found on the surface of mesothelial cells. Researchers suspect that the mesothelin proteinplays a role in cell adhesion, a process that allows cells to interact with and attach to neighboring cells. Studies suggest that an interaction between mesothelin and a protein called MUC16 or CA125 may promote the spread of peritoneal mesothelioma tumors by cell adhesion. 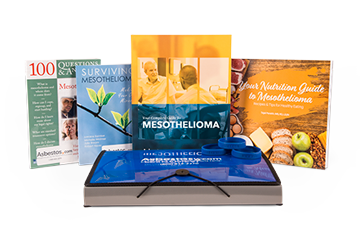 Our packet includes mesothelioma books, information, doctor match help, legal tips, wristbands and much more. Mesothelin is expressed by healthy mesothelial cells, but that expression increases when the cells become cancerous. About 71 percent of mesothelioma patients over-express mesothelin. Mesothelin expressionis high in epithelial mesothelioma tumors but not in sarcomatoid tumors. This means that mesothelin is not helpful at diagnosing, monitoring or treating sarcomatoid mesothelioma. Doctors have tried to develop a mesothelin cancer testwith the hope that it could diagnose mesothelioma by measuring mesothelin alone. But it hasn’t proven successful as a single diagnostic tool. It is helpful when combined with other diagnostic tests to confirm a mesothelioma diagnosis. A mesothelin ELISA test is what doctors use to measure mesothelin levels in a person’s blood. ELISA stands for enzyme-linked immunosorbent assay, which is a test that uses antibodies and color change to identify substances. Tests to detect tumor markers help doctors diagnose cancer and monitor growth or response to treatment. Several blood tests have been developed to measure mesothelin through soluble mesothelin-related peptides (SMRP), which are soluble molecules related to the mesothelin family of proteins. Two of the most well-known tests are called MESOMARK and N-ERC/mesothelin test. Another mesothelin blood test is in development at the University of Bristol in the United Kingdom. In 2007, the FDA approved MESOMARK as a tool to monitor mesothelioma but not as a diagnostic tool. On their own, MESOMARK and N-ERC/mesothelin cannot diagnose mesothelioma. But researchers are hopeful that combining a mesothelin test with tests that measure other biomarkers, such as calretinin, will improve mesothelioma detection. Fluorescence activated cell sorting (FACS) is a special type of flow cytometry that sorts cells and detects biomarkers. Doctors use FACS to isolate mesothelin-bearing cells for research. Primary drugs that target mesothelin are part of a class of drugs called antibodies. The immune system creates antibodies, which are proteins that hunt down things that cause harm such as viruses, bacteria and cancer cells. These harmful agents have proteins called antigens that antibodies attach to like a lock and key. Mesothelin is an antigen and the drugs that target it are antibodies. Approximately 40 percent of mesothelioma patients’ immune systems naturally generate anti-mesothelin antibodies that attach to and attack mesothelin-bearing cells. Researchers are working to identify anti-mesothelin antibodies to use as anti-cancer therapies. They have identified several and tested them in clinical trials without significant success. A few other kinds of drugs target mesothelin. The drug CRS-207 is a cancer vaccine that uses a modified form of the Listeria bacterium to target mesothelin. A person’s own immune cells, called CAR T cells, can also be modified to target mesothelin. A microRNA molecule called miR-21-5p targets mesothelin. Using mesothelin as a therapeutic target is tricky because mesothelin is found in both healthy and cancerous mesothelial cells. We can help you find a mesothelioma clinical trial currently enrolling new patients near you. A lot of research has been conducted on anti-mesothelin antibodies. None of them have proven effective enough to get approved by the U.S. Food and Drug Administration (FDA). But some of them have helped a handful of people with mesothelioma far outlive their prognosis. For example, Andy Ashcroft lived for years with stage 4 pleural mesothelioma thanks to joining a clinical trial that tested Amatuximab, an anti-mesothelin antibody. Ashcroft was among the few mesothelioma participants who responded to the drug. The trial ended because so few mesothelioma patients responded the way Ashcroft did. Currently, several mesothelioma clinical trials are testing therapies that target mesothelin. Renowned mesothelioma specialist Dr. David Sugarbaker is part of the phase 2 trial of anetumab ravtansine, which is based on positive results from a phase 1 trial. In the phase 1 trial, 31 percent of the mesothelioma participants responded to the drug with tumor shrinkage. In another 44 percent, cancer remained stable for a period of time. Researchers are working on finding new anti-cancer agents that may one day work as an anti-cancer therapy for mesothelioma. A 2017 study identified a molecule called miR-21-5p that may block mesothelioma from spreading by targeting mesothelin. A 2015 study in the journal Nature identified new antibodies, called YP218 and YP223, that target mesothelin. Extensive research is necessary to determine whether these new antibodies will prove successful. Servais, E.L. et al. (2012). Mesothelin overexpression promotes mesothelioma cell invasion and MMP-9 secretion in an orthotopic mouse model and in epithelioid pleural mesothelioma patients. Hassan, R. et al. (2016). Mesothelin Immunotherapy for Cancer: Ready for Prime Time? Hassan, R. & Ho, M. (2007). Mesothelin targeted cancer immunotherapy. NCBI. (2018, April 8). MSLN: Mesothelin [Homo sapiens (human)]. Zhang, Y.F. et al. (2015). New high affinity monoclonal antibodies recognize non-overlapping epitopes on mesothelin for monitoring and treating mesothelioma. ACS. (2016, August 8). Monoclonal antibodies to treat cancer.